In his heralded poem “Burnt Norton,” T.S. Eliot speaks of “The still point of the turning world,” a near perfect expression of Change and the Changeless. Eliot attended lectures in 1920s London by the Russian philosopher P.D. 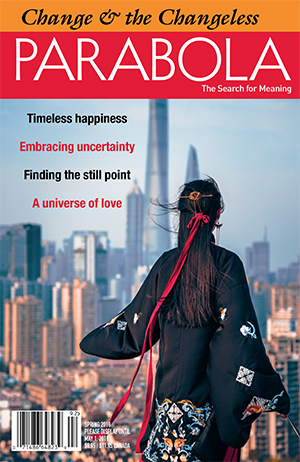 Ouspensky, featured in this Spring 2019 issue of Parabola; no surprise as the search for that still point is a perennial spiritual quest, one that has inspired seekers from the Buddha to Thoreau, Thomas Merton, and countless others including G.I. Gurdjieff, Ouspensky’s own teacher. If we can rest in that stillness, the sages say, we will find there “the peace…that surpasses all understanding”; or “I Am”; or God: call it what you will, it is the Center that does hold. To reach it requires effort and guidance. And so this issue opens with meditations on the changeless and change by masters of the spirit: Ramana Maharshi, Lewellyn Vaughan-Lee, and Adyashanti. At this year’s World Parliament of Religions, those who share those teachers’ visions and many others exchanged their practices and wisdoms; a report by Trebbe Johnson appears in these pages. This issue delves into less traditional realms as well. There is a powerful photo essay on sand dunes by David Ulrich; a call to conscience and common sense from Lucinda Herring, a pioneer of the green burial movement; an exploration of hidden esoteric wisdom in Shakespeare; and a brief visit with an extraordinary man in touch with both change and the changeless, Mister Fred Rogers. May this issue of Parabola serve you well.